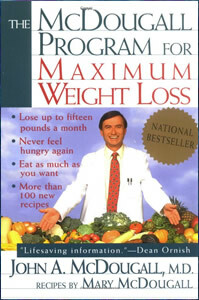 The McDougall Diet came about when Dr. John McDougall worked as a medical practitioner on a sugar plantation in Hawaii. He discovered that his older Filipino, Japanese, and Chinese patients – who consumed a diet of rice and vegetables – were thin and free of chronic disease. Conversely their children and grandchildren, eating a modern diet with meat and dairy products, became fat and sick. Subsequently he created The McDougall Program, which is based on the assumption that ideal weight and optimal health can be achieved and maintained if we eat a diet based on whole and unprocessed low-fat plant foods. McDougall asserts that animal products provide an excessive amount of harmful fats, which increase blood cholesterol levels, damage the arteries and cause heart disease and stroke. In comparison, plant foods provide us with immune-boosting and cancer-fighting antioxidants, phytochemicals, vitamins, minerals, and other health-promoting substances. According to McDougall, humans were designed to crave sweet-tasting foods like starches, vegetables, and fruits because they provide us with energy and quality nutrition. He claims that if you don’t eat enough carbohydrates you are likely to feel hungry and may tend to overeat. On his program you will consume between 70 and 90 percent of calories from complex carbohydrate foods like whole grains and root vegetables. You will add fruits, vegetables, sauces, dressings and seasonings to create complete meals. Foods to be avoided on this program include meat, fish, poultry, eggs, dairy products, nuts, olives, fats, oils and refined flour products. There are no limits on the amount of food you can eat and you are encouraged to eat to the full satisfaction of your appetite, without regard to calories. Because all of the foods are low in fat and high in fiber you will naturally consume a caloric intake that will allow you to effortlessly lose weight. Oats, brown rice, quinoa, couscous, whole wheat bread, whole wheat pasta, oat bran, sweet potato, butternut squash, cannelloni beans, garbanzo beans, lentils, fresh fruits and vegetables, raisins, low fat soy milk, fat-free soy mayonnaise, soy sauce, balsamic vinegar, herbs and spices, carob powder, herb tea. Although diet is the focus of the McDougall program, exercise is also recommended as an essential component of a healthy lifestyle. Even a daily walk can improve your health by reducing your triglyceride and blood sugar levels, alleviating depression, boosting energy and assisting with weight loss. The McDougall Program for Maximum Weight Loss retails at $18. Also available is The McDougall Quick and Easy Cookbook: Over 300 Delicious Low-Fat Recipes You Can Prepare in Fifteen Minutes or Less for $16.50. Many dieters have experienced successful results on the McDougall Diet for weight loss and recovery from chronic health conditions such as heart disease and diabetes. Does not require calorie counting or limiting portions. Can be followed as a lifestyle approach to healthy weight management. Addresses the psychological factors involved in successful weight loss. Provides tips on eating out. Author is a medical doctor who specializes in weight loss and preventative medicine. Very restrictive and requires complete elimination of meat, dairy products, eggs, oils, chocolate, coffee and alcohol. Some dieters do not respond well to a starch-based diet and may experience hunger between meals or blood sugar imbalances. Diet may be too low in protein for many individuals. Meal plan appears to be lacking in adequate essential fats. Necessary to take a vitamin B12 supplement. The McDougall Diet is a low fat plant-based diet that has been used by many dieters with success to achieve weight loss and for the management of conditions including heart disease and diabetes. According to Dr. McDougall all fats must be strictly avoided, however this advice conflicts with current knowledge about the value of healthy fats in the diet, which have been demonstrated to improve cardiovascular health and weight management when consumed in moderation. See Also: Dr. McDougall’s latest book, The Starch Solution. MacDougall Diet is a very simple formula to follow and it works. A friend of mine has breast cancer and has refused all treatment and is just doing MacDougall Diet with curcumin, brocolli sprouts, lots of onion, garlic and other things. Her cancer has regressed and even shrink in the visible nodes. 12 months in. I’ve been following the McDougall program for 10 months. I’ve lost 10 pounds and the stubborn belly fat that has been plaguing me. My bmi is now 19. I’m never hungry after a lifetime of counting calories. I’m a convert for life! Taking a B12 tablet once a week isn’t a hardship. I follow the McDougall diet since a few months. I was already vegan before, but always had joint pain and acne. I workout every two days and try to move when I can. I noticed that when I do not eat enough I get cravings for fatty foods. I feel GREAT all the time and eat plenty. Sometimes I eat breads and sugar, but no fat, I guess with my level of activity it’s OK. Only thing I would recommend is for people that cannot / don’t want to exercice, please put an emphasis on green/yellow veggies and fruits. This will help you loose weight.